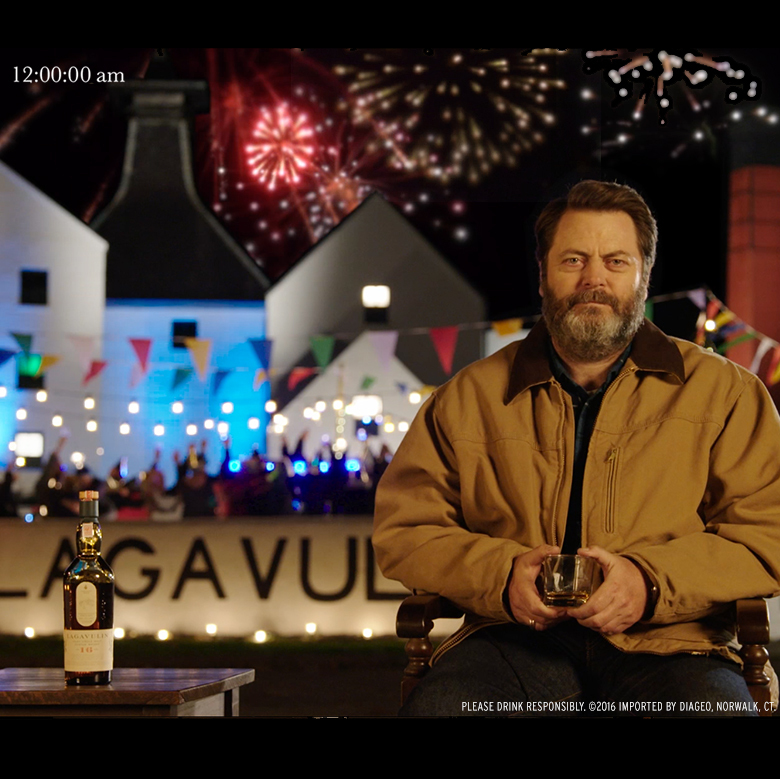 Move over tree-lightnings and ball drops, there’s a new holiday tradition in town: watching Nick Offerman sip Scotch for an hour. As a sequel to last season’s smash hit Yule Log, in which the comedian/woodworker/whisky enthusiast (if you can call anything he does “enthusiastic”) sat in front of a roaring fire and started into the camera while silently drinking, this year’s installment is a New Year’s Eve countdown, complete with a raging party happening… very far off in the distance. Offerman counts down by, of course, not counting down and once again sitting plainly in a chair while we’re left to watch the riveting sip-by-sip action. The anti-celebration fits right in with his well-honed persona. “I never make New Year's resolutions because I apply myself to every day of the year in a fashion that can only be described as 'resolute’” Offerman says. “Because I am not a fool, my determined recipe for delicious living naturally involves a responsible savoring of Lagavulin.” Okay, so it’s an ad for Lagavulin, but frankly we’re into it. So forget Seacrest and don’t even bother throwing “When Harry Met Sally” on at your party. Throw this video up on your TV at precisely 11pm on Dec. 31st and, if you’re worth your salt, snag a bottle of Lagavulin to enjoy right along with Nick.